Alwyn’s ten books include poetry, fiction and non-fiction. She has won a number of competitions and is very widely represented in magazines, anthologies and on-line. She has appeared at many literary festivals and other literary events and gives readings all over the world. Her latest books are Rapeseed (a novel) and In the image: portraits of mediaeval women (poetry collection). This entry was posted in Uncategorized on February 28, 2019 by reubenwoolley. Juliet Cook’s poetry has appeared in a small multitude of magazines. She is the author of numerous poetry chapbooks, recently including a collaboration with j/j hastain called “Dive Back Down” (Dancing Girl Press, 2015), and an individual collection called “From One Ruined Human to Another” (Cringe-Worthy Poet’s Collective, 2018). This entry was posted in Uncategorized on February 25, 2019 by reubenwoolley. on a main road and the county grinds to a halt. and a school are bedding down for the night. cold, it might be icy, we will have to stay home. This entry was posted in Uncategorized on February 22, 2019 by reubenwoolley. The first time I read, some time we are heroes, my reaction was: “Ah! Some time we are all heroes!” However, to attempt to read the author’s intentions too closely would be to lose a sense of poetic improvisation inspired by the substance and flow of jazz. These are collage poems woven together by a tale of two broken persons struggling to communicate. At points, the story is heartbreaking, and the experimental nature of Woolley’s writing befits the indeterminacy and mystery evoked by each piece. Reuben Woolley, a Brit living in Spain, is a highly-regarded poet who has been featured in publications such as jacket2. He edits the online journals, The Curly Mind, a venue for innovative poetry, and, I am not a silent poet, an online journal dedicated to poetry addressing all types of abuse, an overtly political mission. Although, the poems in some time we are heroes are not explicitly political, Woolley has published with Erbacce, a widely-recognized progressive press in the UK, and his poems have appeared in the online journal, Proletarian Poetry. The author communicated with me recently that, “Among the influences on the work are a wide range of British, American and European poets, writers such as James Joyce and Samuel Beckett, whose plays I consider to be among the greatest poetry of the 20th Century, and musicians such as Captain Beefheart, Bob Dylan, Roy Harper, Miles Davis, John Coltrane, Ornette Coleman, and Terry Riley.” Though the epigraphs to this review may appear to be contradictory, Woolley has made clear that his writing process and conventions, including his use of white spaces, is intentional. Indeed, the poems in this collection are carefully crafted examples of innovative literary minimalism. Within the genre, “experimental,” some time we are heroes can be considered a collection of collage poems for which words, phrases, and sentence fragments do not necessarily follow logically from one another, having the effect of isolating the words in a manner that makes them more or less equivalent in weight or importance to what a typical SENTENCE might be in a more traditional poem. In some ways, this is similar to the weight or significance given to single lines when the first letter of the first word of a line is capitalized for each line of a poem [as per, for example, many poems by Wallace Stevens and John Ashbery]. Collage elements are, particularly, enhanced by the use of white spaces that might, also, be viewed as erasure and that highlight the rhythms inherent to jazz’s improvisation [“ i just tick/for syncopation/ he says.who cares/for words”]. Some critics have suggested that using white spaces may indicate a subject that is otherwise absent, perhaps suggesting all that goes unsaid between mary and john, the central characters of the book. Woolley’s use of periods between words, also, highlights rhythmic components of language, creating chord-like components, similar to chords in a traditional piece of music or to the typical 12-chord structure of jazz compositions. Other features that mark Woolley’s collection as “experimental” include titles that, for the most part, bear no apparent relationship to the poem that follows. Further, the absence of caps throughout the text is a convention having the effect of not privileging one word over another—even “given” names: mary, john [“nothing is a name.say nothing”]. Like Stein mentioned above, repetition plays a central role in some time we are heroes. The couple, mary and john [“sad john/said mary”], appear over and over as their troubled relationship is depicted, including, references to alcoholism [“& how john/was always there/with an ear & a drunk”]; allusions to mary’s addiction [“the show/couldn’t start.mary/had to place/ the needle/ just so/the tracks.the traces”]. Within these disturbed and disturbing scenarios, a baby appears [“ I bear/a daughter/a john/& stitches”]—perhaps evidence that john and mary still maintain some level of physical intimacy in an otherwise fractured bond. The repetition of wet things—liquid things—is ubiquitous throughout the text, [ e.g., water, blood, rain, beer, breast milk, ocean, liquor, tears], and the occasional use of “cut” or “cutting” introduces dark elements. Woolley’s symbolism is understated though one cannot overlook biblical meaning in mary’s and john’s names and references to a life force by employing “blood,” “red,” and water. Of course, the color, “red,” also, indicates, danger, a signifier for the perilous emotional path upon which the couple treads. 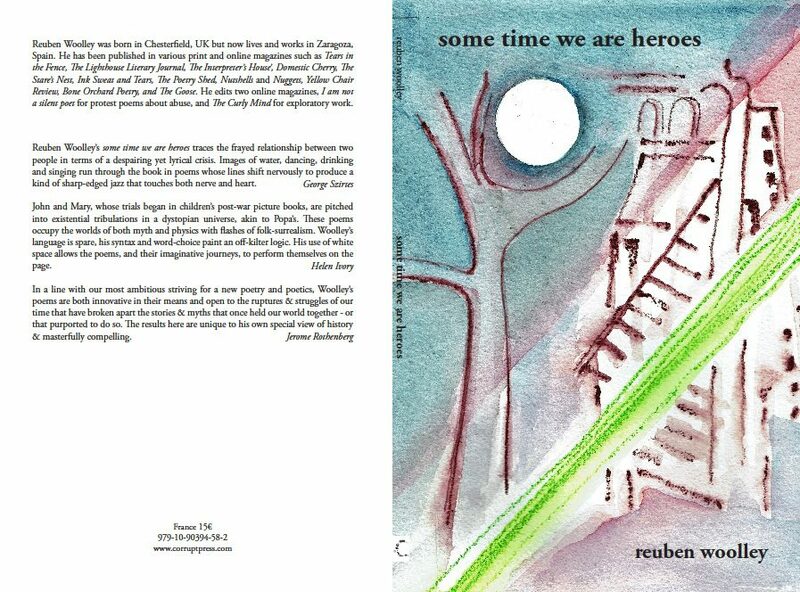 On balance, some time we are heroes is the most impressive volume of poetry that I have read in some time. Because of thematic and symbolic repetition, the book coheres as a unified text despite collage and other innovative, experimental elements. Woolley’s reputation as a mature poet is well-deserved, and I look forward to reading his future work. *For a broad overview of this topic see: Bray J, Gibbons A, McHale B, Eds. (2015) The Routledge companion to experimental literature. Routledge, London and New York. This entry was posted in Uncategorized on February 10, 2019 by reubenwoolley.